UPDATE: The Argent Cosmos had refloated with the incoming tide and was en route to the Port of Longview at 2:15 p.m. Thursday, a Coast Guard spokesman said. Petty Officer First Class Levi Read said Coast Guard inspectors would examine the ship after its arrival. Two tugs are assisting the ship as it heads upriver, Read said. He said an earlier report that the ship's last port of call was in Longview was incorrect -- it was actually Port Westward. 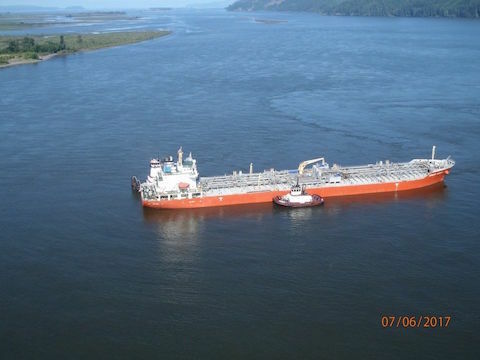 A 557-foot tanker loaded with 1.63 million gallons of ethanol and 6.65 million gallons of monoethylene glycol ran aground Thursday morning near Skamokawa, Washington, on the lower Columbia River, the U.S. Coast Guard says. There are no reports of pollution in the river, flooding aboard the vessel or injuries to crew members, the Coast Guard said in a news release. Skamokawa is about 33 miles downriver from the Port of Longview and perhaps 45 miles from the mouth of the Columbia River. The tanker, called Argent Cosmos, ran aground at about 6:28 a.m. after the vessel lost the use of a fuel pump. The incident points to the hazards of transporting fuel on the river as well as a proposed Port of Vancouver oil transfer terminal, said Daniel Serres, conservation director for the watchdog group Columbia Riverkeeper. "This could be a reminder to everyone we may not want to put a tanker loaded with crude oil every day down the Columba River which is what we'd see with the Tesoro Savage Vancouver Energy terminal," said Serres, who noted the spot of Thursday's incident is a common spot where ships run aground. A Coast Guard aircrew aboard an MH-60 Jayhawk helicopter from Sector Columbia River conducted an over flight at 9 a.m. and reported no signs of pollution, the release says. A 29-foot Response Boat-Small II from Station Cape Disappointment is en route to the vessel with a Sector Columbia River inspections team. In addition to the ethanol and monoethylene glycol, the Argent Cosmos is loaded with 458,074 gallons of high-sulfur oil and 99,064 gallons of low-sulfur oil. The vessel was heading to the Pacific Ocean after finishing a port call at Longview, Washington. Two tugs are on scene to assist the vessel as the water rises with the incoming tide. The Coast Guard has ordered the vessel to not move until its "inspectors ensure the safety of the environment and the crew aboard," the release says.